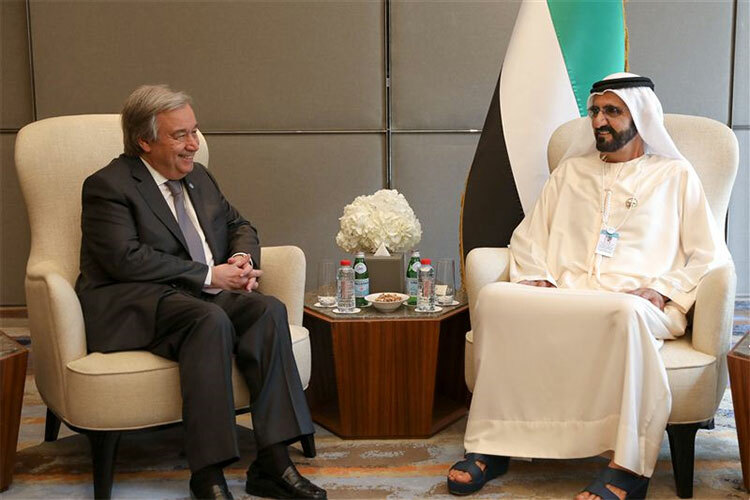 The International Humanitarian City (IHC) was founded in 2003 by His Highness Sheikh Mohammed bin Rashid Al Maktoum, Vice-President and Prime Minister of the United Arab Emirates and Ruler of Dubai, through the merger of Dubai Aid City (DAC) and Dubai Humanitarian City (DHC). It is the one and only non-profit, independent, humanitarian free-zone Authority hosting a community of members comprised of UN organisations, international non-governmental organisations, intergovernmental organisations, and commercial companies. Today, over 14 years later, IHC is the largest humanitarian hub in the world with the most diverse members. It plays a pivotal role in facilitating first responses to crises at a global level efficiently. Based in Dubai, IHC has a strategic location allowing rapid relief to be within reach in all corners of the world. In 2011, IHC tripled its size and moved to its current strategic location at 18 km from Al Maktoum Airport and 21 km from Jebel Ali Port, the largest man-made port in the world, giving members the ability to move shipments from sea to air in as little as 10 minutes. Chaired by Her Royal Highness Princess Haya bint Al Hussein, IHC enables its members and aid agencies to conduct fundraising activities in the United Arab Emirates with the partnership and support of the City to obtain government approval. In other terms, IHC exists for its members. Benefiting from the position of Dubai as a hub for transport modes, logistics, and value-added services, it offers an innovative approach to support humanitarian response through its facilities, warehousing and close-knit network of partners in the private sector, local community, and government. In early 2017 and in light of the growing demand for aid and the need of agencies for additional warehousing and logistics support, HH Sheikh Mohammed Bin Rashid approved the expansion of IHC. The move will see the facility grow by more than 300,000 square metres. What makes Dubai’s International Humanitarian City a reliable destination? On 4 October 2015, His Highness Sheikh Mohammed Bin Rashid Al Maktoum founded Mohammed Bin Rashid Al Maktoum Global Initiatives with the aim of improving the Arab world through humanitarian, developmental and community work. The MBRGI Foundation covers four sectors essential for promoting life and dignity around the world: combating poverty and disease, spreading knowledge, empowering communities, and entrepreneurship and innovation for the future. It seeks to assist over 130 million people including families, children, and youth in 116 countries, with a special attention to the challenges that face the Arab world. The International Humanitarian City is one of the member entities under the umbrella of Mohammed Bin Rashid Al Maktoum Global Initiatives.